Hi, friends! Did you have a nice Thanksgiving? I certainly did! I mean, I can't have anything against a holiday that makes it socially acceptable to stuff your face (or, if you're Italian like me, you do that on every holiday). Today I'd like to share with you a few of my favorite beauty products I've discovered or rediscovered in the past two months. 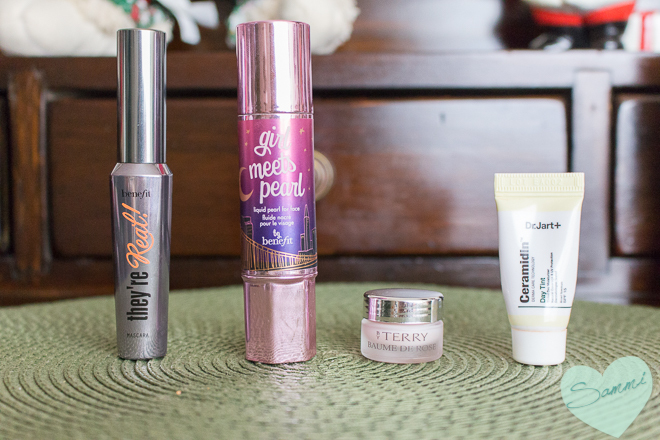 I didn't have much to talk about favorites-wise last month, so now it's back with twice as many products worth mentioning! BENEFIT They're Real! 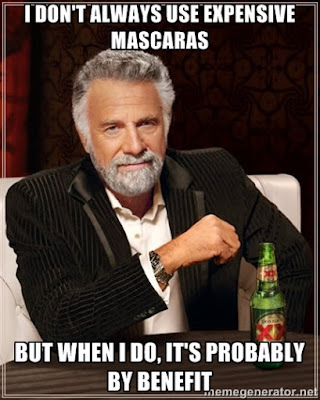 Mascara in Black ($24 | .3oz) - Has it really been a year since I last used this mascara? I mentioned this in my January 2014 Empties, so it's safe to say it's been awhile! This is my first full-size tube (my last one was a deluxe sample) but I don't notice any difference between the two. I forgot how easy it is to get big lashes with this! With just one swipe, it makes a huge difference in my lashes--in length and volume. For daytime, I can just put one coat on and call it a day, but for nighttime I like to apply another coat or two. When I first used this, I found it was a little hard to remove, but as long as you use something oily (whether it be a cleanser, makeup remover, or actual oil), it should come off fairly easily. I'd purchase it again! BENEFIT Girl Meets Pearl ($30 | .4oz) - A new addition to my small collection of highlighters and glowy-type products. It was love-at-first-swatch when I tried this in Sephora a few years ago, but then completely forgot about it until now. I'm so happy I purchased it! This isn't going to pack a punch like theBalm or Becca; it offers a natural, pearly pink highlight. It's more of a "glow from within" kind of highlight. I even like to use this on days when I'm not wearing makeup--just a touch to the cheekbones and cupid's bow makes the skin look so dewy and fresh! BY TERRY Baume de Rose ($60 | .4oz) - I ran out of my Egyptian Magic last month and started using a deluxe sample as my nighttime lip balm. This particular lip balm was created a little over ten years ago, and has achieved cult/iconic status by celebrities and makeup artists alike. The little jar is made of glass, and the lip balm feels very nourishing on the lips, so it feels quite luxurious. 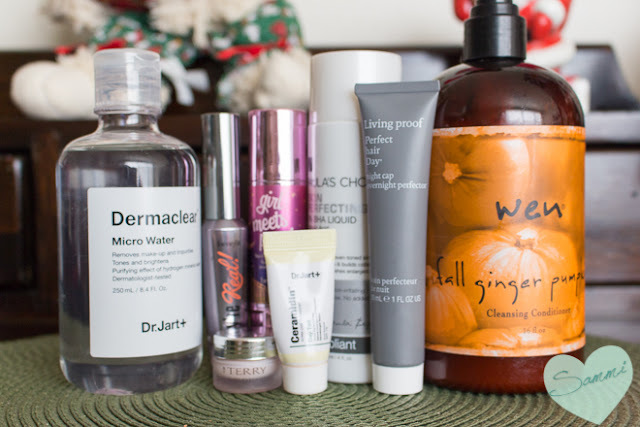 I don't think I could spend $60 in cold, hard cash on the full-size unless I was using Birchbox points, but I think it's quite lovely. It doesn't smell exactly like roses to me--and you can't smell much of anything unless you practically stick your nose in it--but I like that it's not too fragranced. You can also use it on cuticles, but I'd rather use something cheaper on my nails. When it's gone, you'll probably see me wearing all black and in mourning. DR. JART Ceramidin Day Tint ($48 | 1.7oz) - For any long time readers of this blog, you'll know I'm a huge fan of the Dr. Jart brand. I received a sample of this tinted moisturizer in my May Birchbox and I think it might be my favorite one by them yet! It makes my skin feel incredibly soft, and it matches my skin tone closer than any of the other varieties they sell (even though they all really match to your skin after you've applied it). It still offers sun protection and a slew of other benefits, but I can't get over how smooth and hydrated my face feels after applying it. Like their other BB creams, if you like light coverage and soft skin, you'll enjoy this a lot. 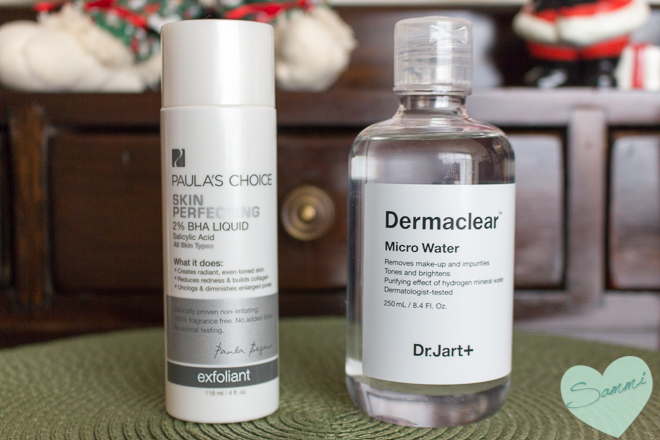 DR. JART Dermaclear Micro Water ($32 | 8.4oz) - This cleansing water sample came in my June Birchbox and let me tell you: I've never used up a sample and purchased a full-size of something so fast! This cleansing water doesn't just remove makeup and cleanse skin--it also makes it feel so soft! I'm telling you, Dr. Jart is the way to go. I don't know what they did to the molecules in this water, but my skin is digging it. A fellow blogger friend said that she felt it left a bit of a residue on her skin, but my face just felt hydrated. If you have dry skin and are looking for a cleansing water, I can't recommend this one enough. PAULA'S CHOICE Skin Perfecting 2% BHA Liquid Exfoliant ($28 | 4oz) - It's hard to believe I've only been using this salicylic acid liquid exfoliant for a year or two--I can't imagine going without it now! About a year ago, it was featured in my Skincare Tips for Winter post and probably a dozen others. My skin feels so smooth and soft after using this (are you sensing a trend here?). The fact that this cleanses deep into the pore makes my skin absorb serums and moisturizers better. It's also a warrior at battling blackheads. It hasn't eliminated 100% of mine, but it's done a heck of a job and reducing them and shrinking the enlarged pores around my nose. I'm probably going to never be without it. Just go ahead and bury me with a bottle when it's time. LIVING PROOF Perfect Hair Day Night Cap Overnight Protector ($28 | 4oz) - I received a sample of this leave-in conditioner in my Limited Edition Lovely Day Birchbox. Originally I started using it because it didn't contain silicones (meaning it's sulfate-free friendly), but I find that I still reach for it even though I've gone back to using my regular sulfate shampoos. It's not too heavy, but it still conditions the hair and makes it feel soft. I don't solely use this at night, but rather when my hair is somewhat dry after a shower. I don't know about the claim that the benefits last for up to five showers, but they at least last for one! Being that you only need a pea (or at most a dime-sized) amount, 4oz should last a freakishly long time. 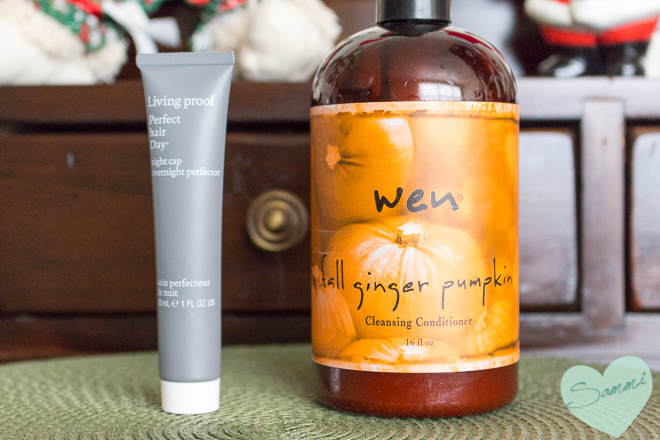 WEN Cleansing Conditioner in Fall Ginger Pumpkin ($40 | 16oz) - I've had a bottle of Wen's Cleansing Conditioner in my bathroom longer than I've had this blog! I feel like I mention this product in a monthly favorites post at least once a year. I don't use this instead of shampoo as advertised, since I find that it doesn't make my hair look or feel as clean by my scalp, but I really like it as a conditioner. This limited edition fall scent smells more like ginger and less like pumpkin, but I'm not complaining! The winter scent will be coming out soon, so if you're looking to get this one, I suggest you order it now! (Or, if you've been eyeing the class action lawsuit (!! ), feel free to pass on this one). VIDEO GAME: Undertale - If you play video games, you've probably heard about it. It's gotten a lot of buzz in the past two months since it came out. I'm so obsessed with this game, I can't even tell you. The storyline is seriously one of the best and I just can't get over it. It's such a short RPG--probably the shortest one in history (7 hours), but it's kind of taking over my life. I don't want to spoil anything, but one of the coolest aspects about this game is that you don't have to fight the monsters like you traditionally do in games. You can, and are even encouraged, to become friends with them! If you like games, you should seriously buy it because it will be the best $10 you will ever spend. Have you ever played it? Please tell me, because I need more people to gush about it with. TELEVISION: The Voice - It's been on for nine seasons, but this is the first time I've actually sat down and watched it. And I am SO HOOKED! I'm so invested in these contestants in a way that I never was with American Idol. Maybe it's because the audition process gives you more of a backstory, or maybe they just needed to put more effort into the show itself since they don't have Simon Cowell acting as the Gordon Ramsay of the music world. Either way, I'm so addicted to this show. Do you watch it? Who's your favorite contestant? It's really hard for me to choose, but if I had to I would say Amy because she can literally sing any genre and make it her own. What's the best thing you tried this month? Disclaimer: All products were purchased by me, not sponsored. Some links are affiliate links, so if you click it, you give a penny to a poor college graduate. Save a life, save a friend.